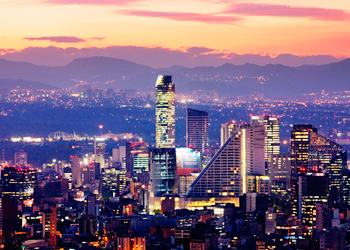 Ciudad de Mexico (Mexico City) is Mexico’s capital city and one of the most important political, cultural, educational and financial centres in North America. With a GDP of $411 billion US dollars in 2012, it is ranked as the eighth richest city in the world. Settling on an altitude of more than 2,000 metres, tourists are instantly enamoured by the city’s glamour, cultural heritage and contemporary development. Every corner of the city is sprinkled with stories to tell of famous personalities and ancient tribes. While the Aztecs discovered and gave the city its culture and heritage, the Spanish revamped and added their touch. Today, the cultural amalgamation is mirrored in every landmark of Mexico City, be it the Templo Mayor, El Zócalo square, Catedral Metropolitana or Frida Kahlo museum. El Zócalo (formally called the Plaza de la Constitución) is Mexico City’s historic plaza where Spanish conqueror Hernan Cortes is said to have met Aztec emperor Moctezuma in 1519. After the conquest of Mexico, Cortes re-designed the Aztec capital, Tenochtitlan in conformity with Spanish traditions. It comprised of a square at the heart of the city, surrounded by stately colonial buildings, elaborate churches and elegant mansions. 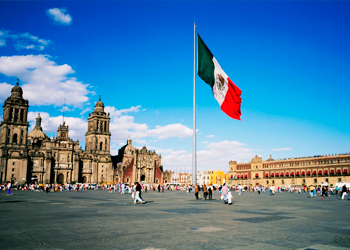 The square has long been the centre for festivities and events such as the Dia de la Bandera on February 24 and Grito de la Independencia on September 15 & 16. During the Christmas season, the square lights up in a maze of colours. A walking tour of the historical centre can be arranged at anytime of the day. The Independence Monumeent, officially called as “Columna de la Independencia”, was built to commemorate the War of Independence centennial celebrations in 1910. The victory pillar is also referred to as the Angel of Independence, due to the glimmering golden angel standing atop the 36-metre column. 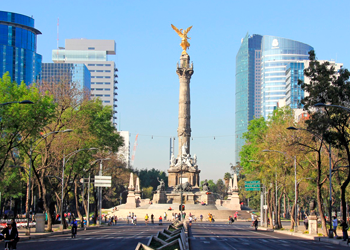 At night, when the monument is illuminated, it casts a spectacular effect over the neighbouring Paseo de la Reforma Avenue. In 1925, the memorial was transformed into a mausoleum, when the names of war heroes were etched at the base of the monument. More recently “El Ángel” has become the traditional gathering place for celebration amongst Mexico City inhabitants, particularly following Mexico national soccer team victories and as a focal point for political rallies. The ancient ruins of Templo Mayor, located northeast of the Zócalo, provide an insight into the lifestyle of the Aztec Empire settled in Tenochtitlán city. It is Mexico City’s one of the most important historic landmarks, designated by UNESCO as a part of World Heritage List in 1987. The Great Temple devoted to Huiztilopochtli and Tlaloc, measuring approximately 100 by 80 m (328 by 262 ft) at its base, dominated the Sacred Precinct. Construction of the first temple began sometime after 1325, and it was rebuilt six times after that. The temple was destroyed by the Spanish in 1521. The wide expanse of the site was accidentally discovered by a telephone repairman in 1978. Since then, its excavation has reported thousands of stone carvings, jewellery and skulls of sacrificial victims from rival tribes. All this and more is displayed at the adjacent Museo del Templo Mayor. 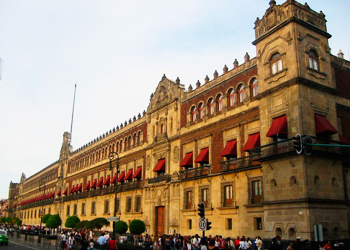 The Palacio Nacional (National Palace) located on Mexico City’s main square El Zócal, is the presidential residence for Mexico’s ruling community since the Aztec Empire. In fact, much of the construction material of the current building is of what were called Moctezuma II’s “New Houses”. The colourful murals by Diego Rivera that adorn the main stairwell and the walls of the second floor, are of particular interest. Diego Rivera painted these scenes between 1929 and 1952 to depict the history of Mexico from 1521 to 1930. 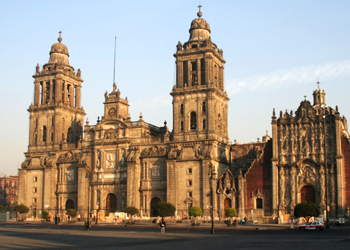 The Metropolitan Cathedral is the oldest and largest in the Americas and the seat of the Roman Catholic Archdiocese of Mexico. In the late 16th century, Hernan Cortes initiated the construction of a church on the Aztec ruins of the Templo Mayor to secure Spanish power. The present cathedral dedicated to the Assumption of Mary was built around the original church over sporadic intervals from 1573 to 1813. Spanish architect Claudio de Arciniega who was appointed to design the cathedral, took inspiration from the various cathedrals in cities such as Valladolid and Málaga. The Frida Kahlo museum (Museo Frida Kahlo), also known as Blue House because of its cobalt blue walls, is a historic museum dedicated to the life & work of Mexican artist Frida Kahlo. 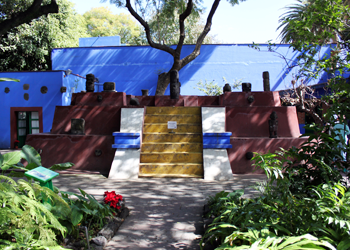 The Casa Azul (Blue House) was where Frida was born in 1907 and returned back in her retiring years. Four years after Frida’s death in 1958, the house was converted into a museum. It prominently highlights Frida and her husband Diego Rivera’s personal belongings like diaries, early sketches, outfits, photographs, memorabilia and other items. However, to see & enjoy Frida’s paintings to a greater extent, visit other museums like the Modern Art Museum in Chapultepec Park or Dolores Olmedo Patiño Museum in Xochimilco. 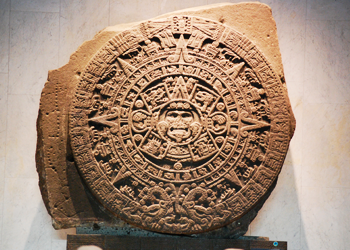 Opened in 1964 by President Adolfo López Mateos, the museum has a number of significant archaeological and anthropological artifacts from the pre-Columbian heritage of Mexico, such as the Stone of the Sun (or the Aztec calendar stone), the 16th-century Aztec statue of Xochipilli and the giant stone heads of the Olmec civilization. Designed in 1964 by Pedro Ramírez Vázquez, it has an impressive architecture with exhibition halls surrounding a patio with a huge pond and a vast square concrete umbrella supported by a single slender pillar (known as “el paraguas”, Spanish for “the umbrella”) around which splashes an artificial cascade. 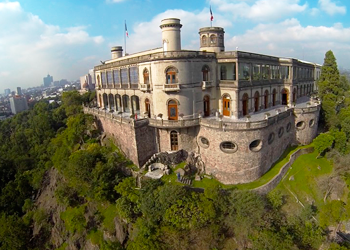 Castillo de Chapultepec is a castle located on the top of the Chapultepec Hill in Mexico City. The name Chapultepec is derived from the Náhuatl word chapoltepec, literally means “at the grasshopper’s hill”. The castle’s location, which was a revered place for the Aztecs, has adorned various roles throughout the Mexican history. It has been home to the Military Academy, Imperial residence, and observatory and is presently the address of the Museo Nacional de Historia. It is the only Royal castle in American continent and North America to accommodate European sovereigns such as the Mexican Emperor Maximilian I and his Empresses Carlota. 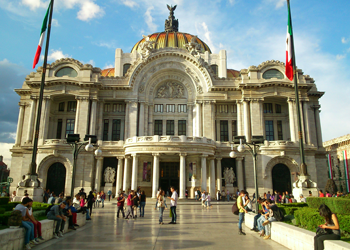 The Palacio de Bellas Artes (Palace of Fine Arts) is the most important cultural centre in Mexico and is located in the historic centre of Mexico City near the Alameda Central Park. The first theatre was built in the late 19th century, but it was destroyed in favour of a more extravagant one to commemorate with the Centennial of the Mexican War of Independence in 1910. The initial construction of the palace was commenced in 1904 but stopped due to complications arising from the soft subsoil and Mexican Revolution. Later, the construction was completed under Mexican architect Federico Mariscal in 1934. The design and structure is a mix of Art Nouveau and Art Deco elements as the architects Adamo Boari & Federico Mariscal exchanged hands due to subsequent Mexican Revolution and political tension. Diego Rivera murals prettify the interiors of the building, which is well known for hosting many theatrical performances including the Ballet Folklorico de Mexico. 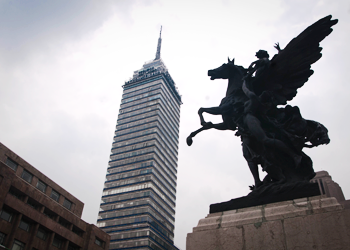 The Torre Latinoamericana was Mexico City’s tallest building from 1956, when it was built, until the 1984. Its central location (It is situated on the corner of the Eje Central and Madero Street), height (188 m or 597 ft; 44 stories) and history make it one of the city’s most important landmarks. It is also widely recognized internationally as an engineering and architectural landmark since it was the world’s first major skyscraper successfully built on highly active seismic land. 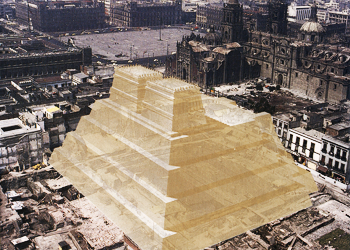 The old skyscraper withstood the 1985 Mexico City earthquake without damage. The 45-floor skyscraper’s telescopes offers breathtaking views of Mexico City from its observation deck. As you climb down, the building features innumerable offices, eateries, bars and even an aquarium.